Dissolve about 3.8 g of the dihydrate of the disodium salt (Na2H2Y•2H2O) and 0.1 g MgCl2 in 1 liter of water. Store in a plastic bottle. A small amount of sodium hydroxide may be added if there is any difficulty in dissolving the EDTA. Try not to exceed 3.8 g of Na2H2Y•2H2O because much more than this dissolves only with difficulty. The EDTA solution should be filtered using suction filtration. See TA for the apparatus. NOTE: Break the suction before you turn off the water flow on the vacuum aspirator. A Ca2+ solution is prepared as the primary standard. Obtain from the TA approximately 0.7 g of predried analytical-reagent-grade CaCO3. Accurately weigh a 0.25-g sample by difference into a 100-mL beaker. Add about 25 mL water and then add dilute HCl dropwise until the sample dissolves, then add 2 drops more. Mild heating will speed dissolution if necessary. Transfer quantitatively to a 250-mL volumetric flask (rinse well with water) and carefully dilute to the mark. (eye dropper!) Mix thoroughly. Because this Ca2+ standard solution is used to standardize the EDTA titrant, it must be prepared very carefully so you know its exact molarity, and therefore the exact (to ± 0.1 mg) mass of CaCO3 weighed out. 1. Pipet 25-mL aliquots of the standard Ca2+ solution into three or four 250-mL Erlenmeyer flasks. Remember that each aliquot contains one-tenth of the CaCO3 weighed out to prepare the standard solution. 2. Take each sample to completion before starting next sample. Add 7-8 mL of pH 10 buffer, 15 mL of water, and 3 drops of Eriochrome Black T and titrate immediately with EDTA until the light red solution turns a LIGHT SKY BLUE. 3. 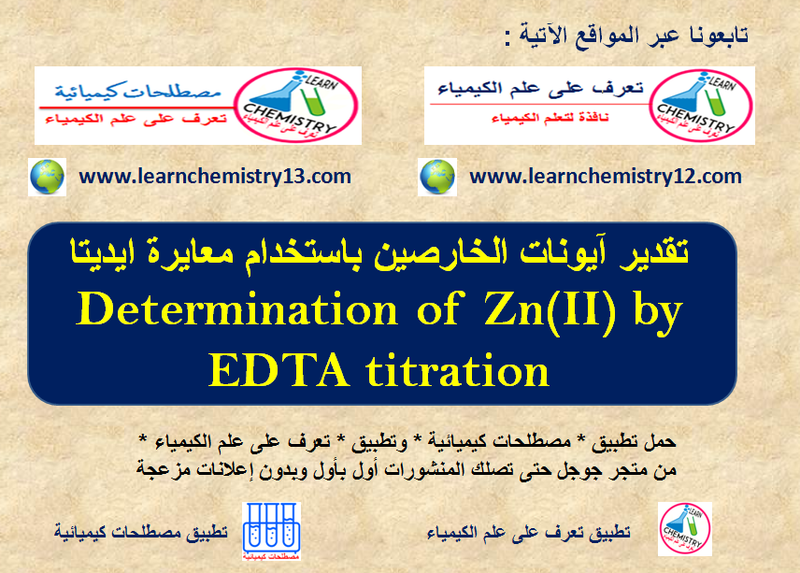 Calculate the molarity of the EDTA from the volume of EDTA used in the titration of each aliquot. 1. Dilute your unknown sample in the 250-mL volumetric flask to the mark with water. Mix thoroughly. 2. Pipet 25.00-mL aliquots into 250-mL erlenmeyer flasks. Add 15 mL of water, 9-10 mL of pH 10 buffer, and 2 drops of Eriochrome Black T immediately prior to titrating a sample. 4. Calculate the number of milligrams of zinc in the total sample. Remember that each aliquot represents one-tenth of the total sample volume. Reference: D. A. Skoog, D. M. West, F. J. Holler, and S. R. Crouch, Analytical Chemistry: An Introduction, 7th ed. Chapter 15, pp. 345-381.